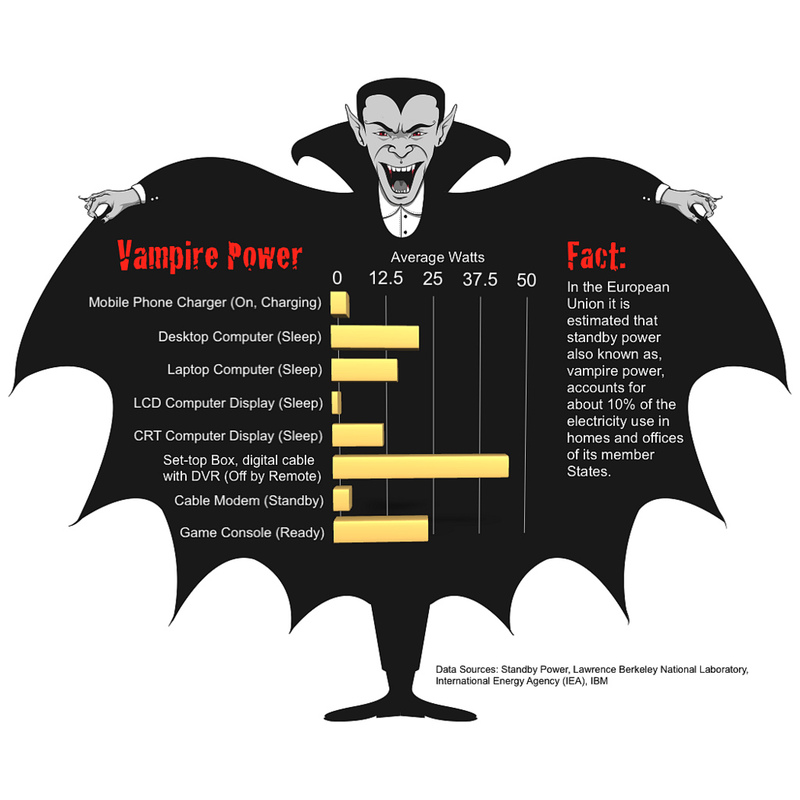 #CHIPS: "Consortium drives stake thru 'vampire power' heart"
The European Union estimates that "vampire power"--the current drawn by electronic devices in standby mode--consumes as much as 10 percent of your monthly energy bill. Illustration: Victor J. Ochoa. #CHIPS: "Graphene bandgap opened by water vapor"
A graphene film on a silicon dioxide substrate is being electrically tested using a four-point probe. #CHIPS: "IBM, Euro researchers seek CMOS successor"
Dr. Heike Riel, who leads the nanoscale electronics group at IBM Research Zurich, is part of Project Steep. Here is what EETimes says about Steep: IBM Research Zurich, Infineon Technologies AG and Globalfoundries Inc. have joined forces with a half dozen European universities and research centers on a mission to cut the power consumption of electronic devices by 10-fold and reduce standby power to zero. Called Steep—because of the steep cutoff slope leading to zero standby power—the European Union-funded project aims to perfect the tunneling field-effect transistor (T-FET) using nanowire channels of silicon, silicon germanium and III-V-on-silicon. 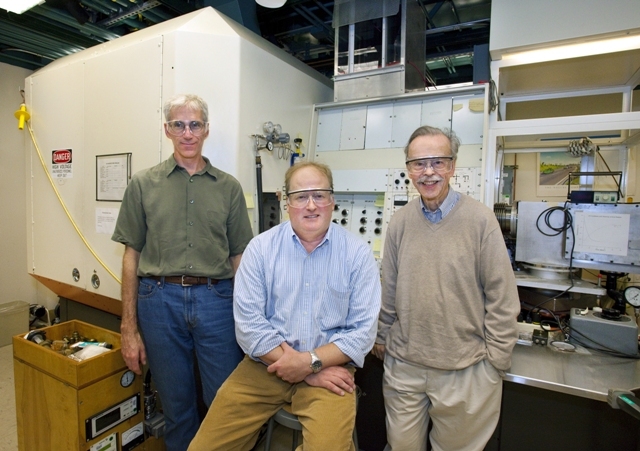 The three-year $5.5 million effort aims to create processes that can be run on CMOS lines to facilitate a smooth switchover from today's complementary metal-oxide semiconductors (CMOS) to T-FETs. 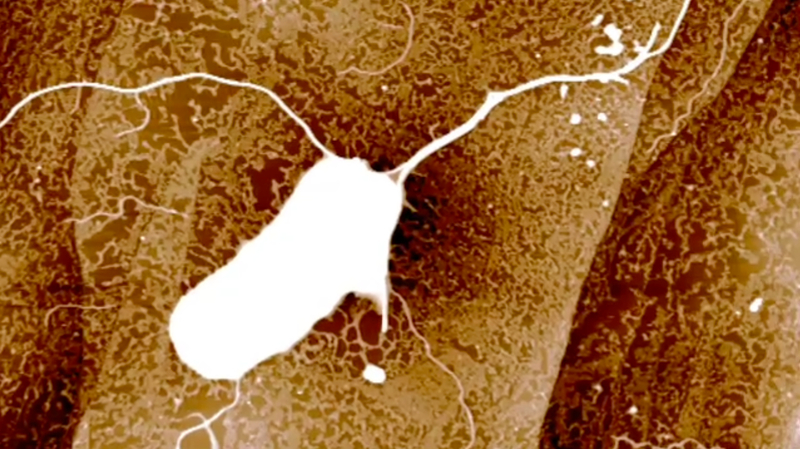 In times of stress, here immobilized in a biofilm, bacteria grow nanowire-like appendages between cells. Here is what Smarter Technology says about bacteria: The human body has long been known to perform internal communications among nerve cells with electro-chemical signals, but now bacteria have been shown to set up their own external communication links among widely separated cells using organic nanowires...The researchers speculate that in nature, these nanowires are used to normalize the metabolic status a biofilm, whereas they propose repurposing them to form self-repairing structures in organic circuitry like the microbial fuel cells under development at USC. 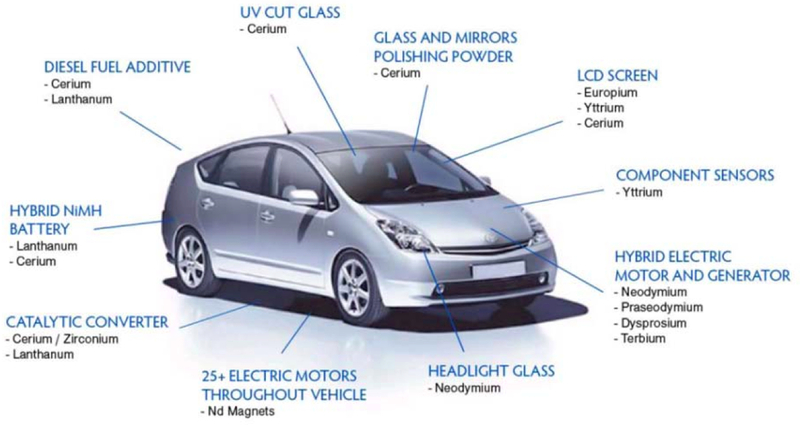 #MATERIALS: "Rare earth supply chain: Industry’s common cause"
Hybrid automobiles make use of rare earths in almost every major subsystem. #CHIPS: "Intel's embedded Xeon tackles avionics"
Here is what EETimes says about embedded Xeon's: Intel has been touting its server-class Xeon processors as an embedded solution platform for advanced pattern recognition tasks, for instance inside the receiver for radar, video, audio or other sensor signals. 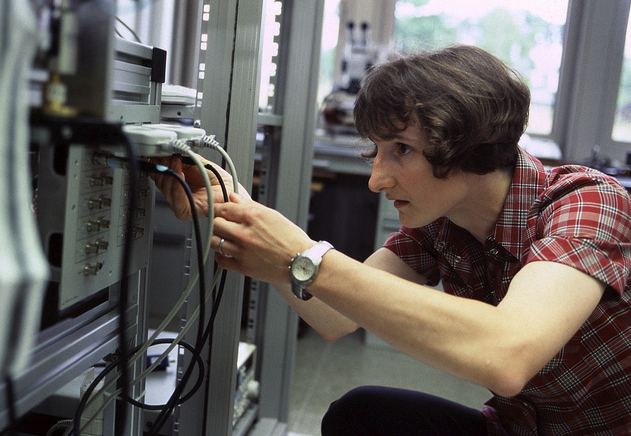 Today those signal processing tasks are assigned to ground-based computers necessitating a high-bandwidth connection between it and the sensor. 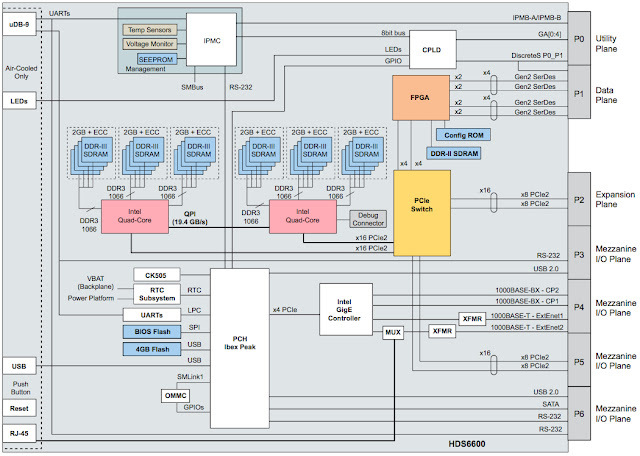 Embedded pattern recognition can be performed by two quad-core Xeon processors (pink) each with 6Gbyte of RAM (blue) and and FPGA (brown) to offload PCIx to RapidIO and Ethernet. Putting a Xeon processor in a ruddegized embedded platform enables avionics, space, surveillance and military pattern recognition tasks to be performed in the field rather than back at the data center, powering applications like detecting IEDs (improvised explosive devices) with a Xeon inside a Hummer. 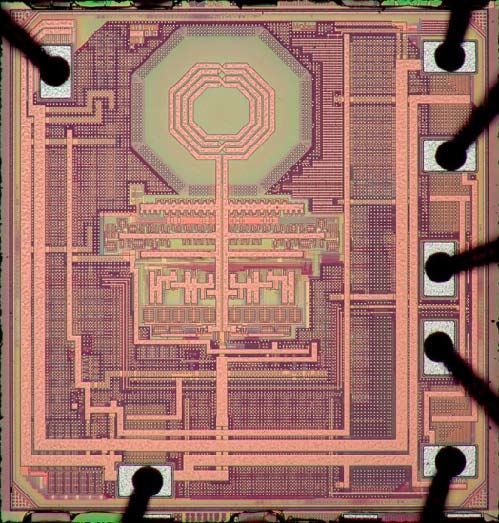 #CHIPS "CMOS oscillator said to beat quartz"
IDT mixed signal die for its all-silicon CMOS oscillator houses a large inductor (top) surrounded by its compensation circuitry. Futurist and R&D pioneer Joel Birnbaum predicted the evolution of pervasive computing. Here is what Smarter Technologies says about cyber security: The Georgia Tech Information Security Center (GTISC) Security Summit debuted the Emerging Cyber Threats Report for 2011, which summarizes the cyber-threat landscape for next year, evaluates the most urgent needs and recommends IT responses to counter the threats. This year, the Cyber Threats Report described three emerging threats for which security experts should prepare: coordinated botnet attacks, social networking breeches and infrastructure penetration that could cause physical damage. 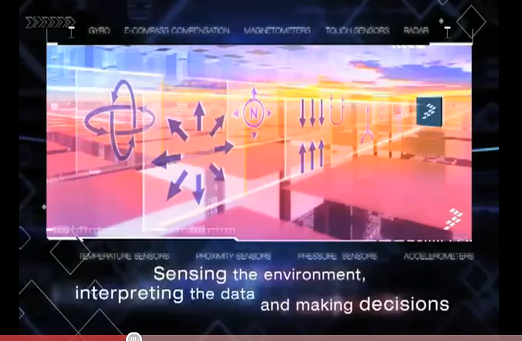 #ALGORITHMS: "Design contest: Win $10,000 for a two-minute video"
Here is what EETimes says about sensing your world: Aimed at identifying the most original application of its smart Xtrinsic MEMS accelerometers, pressure sensors and touch sensors, entrants must submit a video showing the unique aspects of their application. Videos must be two- to three-minutes long and uploaded for public viewing by Nov. 5. The contest's objective is demonstrate novel uses of the "four tees"—touch, tap, tilt and transmit—which are made possible by smart sensors with integrated communications abilities. Multiple entries are allowed, but some restriction apply regarding previously demonstrated applications. Read all the rules here. Pigment fluid can be electrically attracted to the top cavity (making a color) or retreat to below the central mirror (making white), amplifying ambient light in an exceptionally bright display. 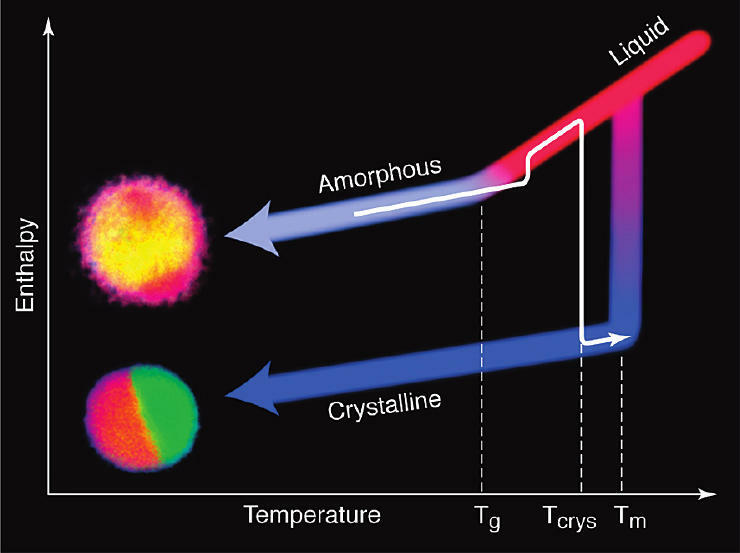 Here is what Smarter Technology says about electrofluidic displays: Before the recession, liquid crystal displays (LCDs) were touted as a legacy technology that would slowly give way to organic light-emitting-diode displays (OLEDs). However, the consumer spending slowdown has instead led to LCD manufacturing overcapacity, prompting Sony and Toshiba to scrap plans for new OLED lines. To the rescue is a new electrofluidic display technology that offers displays that are brighter, faster and lower power than LCDs—and yet can be manufactured by retrofitting existing LCD manufacturing lines. The new electrofluidic display technology uses the same sort of inorganic manufacturing materials as LCDs, allowing their manufacturing lines to be converted over, rather than being made obsolete by organic LED displays. But the biggest advantage of electrofluidic displays is that they require zero power to maintain an image on the screen. Both LCD and OLED displays typically use either fluorescent or light-emitting-diode (LED) backlights for easy reading, but electrofluidic displays instead reflect ambient light. #MEMS: "Xtrinsic sensors trigger satellite airbags"
High aspect ratio micro-electro-mechanical systems (HARMEMS) uses larger moveable elements to provide overdamped transducers that are immune to high-frequency resonance. Here is what EETimes says about airbag sensors: Modern automobiles deploy a variety of airbags depending upon where the impact occurs, requiring that satellite sensors to be deployed around the vehicle to collect and integrate signals to determine whether to trigger front-, side- or other supplemental restraint system (SRS) airbags. #CHIPS: "Freescale rolls auto CPUs for in-dash apps"
Block diagram for Freescale's i.MX534 and i.MX536 automotive processors show its ARM Cortex-A8 core and many peripherals. 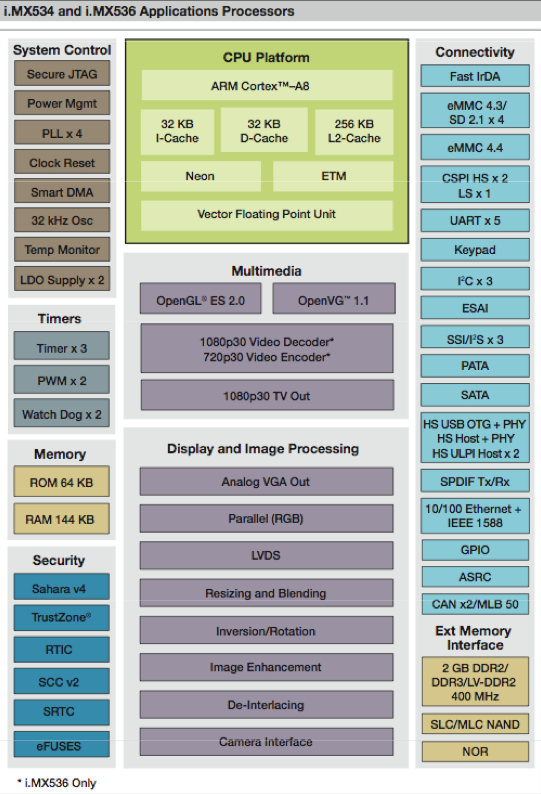 Freescale (Austin, Texas) said its i.MX534 and i.MX536 automotive multimedia processors house two independent graphics processors plus use the latest ARM Cortex-A8 core for running in-dash apps under Android, Linux, QNX or Windows Embedded Compact 7. 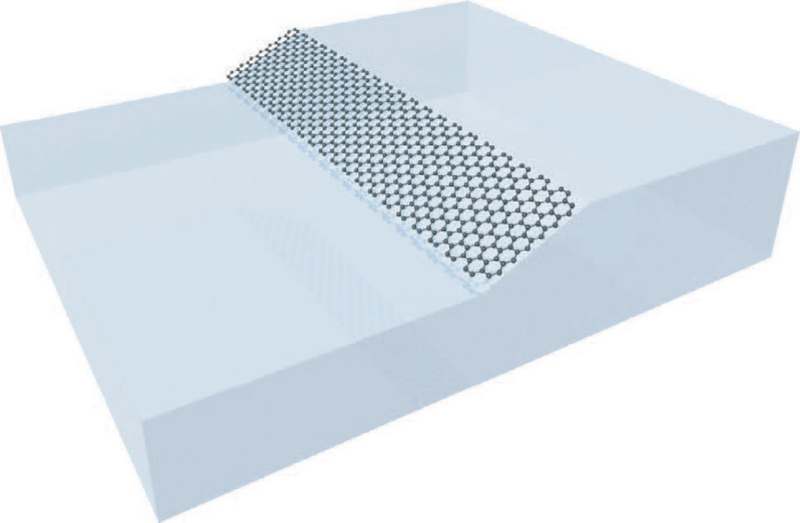 Georgia Tech's new "templated growth" technique forces graphene sheets (black hexagons) to crystallize on contoured edges on a silicon carbide substrate (source: Georgia Tech). 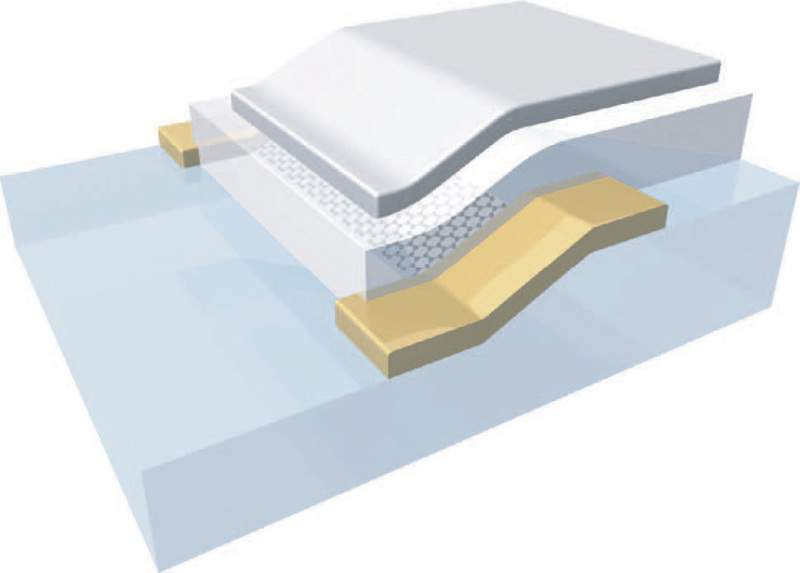 After the graphene transistor channel is grown, conventional lithography can add a insulating dielectric and gate on top with the source and drain electrodes (gold) at each end of the channel (source: Georgia Tech). Here is what Smarter Technology says about carbon microchips: Researchers around the world are inventing ways to harness carbon—an organic material—to build smaller, faster microchips that sidestep the looming problems with inorganic silicon, which is becoming increasingly difficult to fabricate at the atomic level. IBM, for instance, recently demonstrated how to fabricate field-effect transistors (FETs) by smoothing out carbon into atomically thin sheets, called graphene. Now the Georgia Institute of Technology (Georgia Tech) has advanced graphene one more step by inventing a "templated growth" technique for fabricating what they claim is the world's largest array of organic carbon-based graphene transistors. 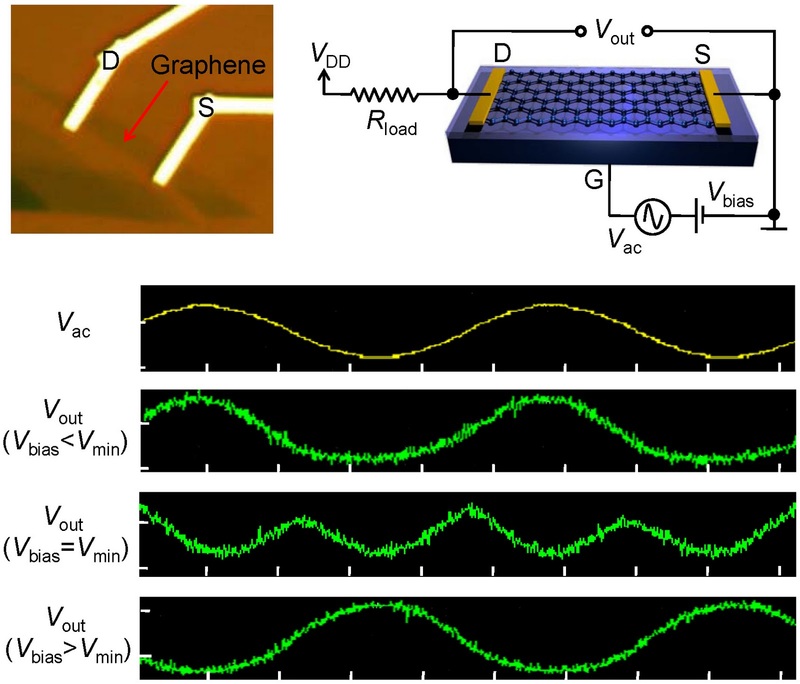 #CHIPS: "Triple-mode graphene transistors go analog"
Triple-mode graphene transistors consist of a conventional metal source (S) and drain (D) with graphene serving as the channel (upper left). For the demonstration, a back gate was used (upper right). When presented with an alternating current input (V[subscript]AC) the output depends the bias voltage--in-phase if its less that the input minimum (third from bottom), out-of-phase if greater (bottom) or frequency doubled if they are equal (second from bottom). 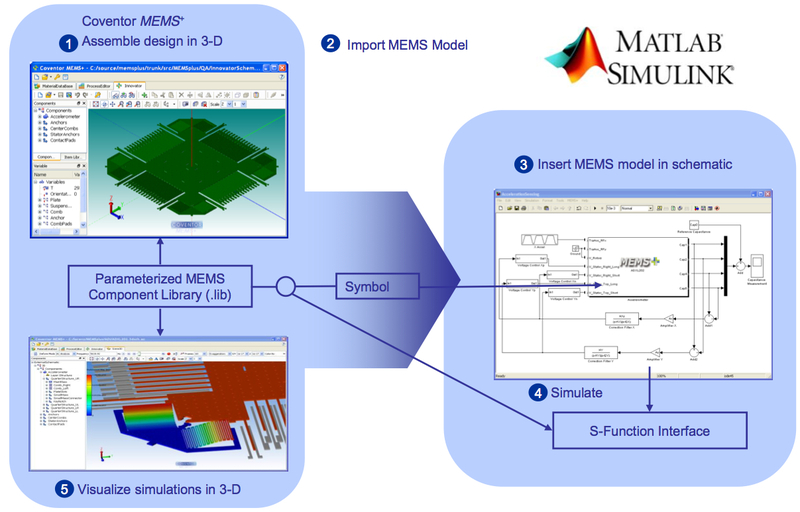 Coventor's MEMS+ 3D design suite for micro-electro-mechanical systems now integrates with Mathlab's Simulink for behavioral modeling and verification of functional correctness. Here is what EETimes says about Coventor MEMS+: MEMS-chip designers can now use Coventor Inc.'s 3-D modeling tool, then verify their designs using MathWorks Inc.'s Mathlab behavioral modeling tool, thanks to modifications made by Coventor (Cary, N.C.) in its latest version of its MEMS+. MEMS+ can now generate schematic symbols and simulation models for The Mathworks' Simulink, Coventor said. MEMS+ already allowed MEM designers to work closely with the CMOS-chip designers by virtue of its tight integration with Cadence Design Systems Inc.'s Virtuoso IC design environment. Now MEMS-chip designers can also use Mathlab's Simulink behavior modeling tools to verify that the design functions correctly. 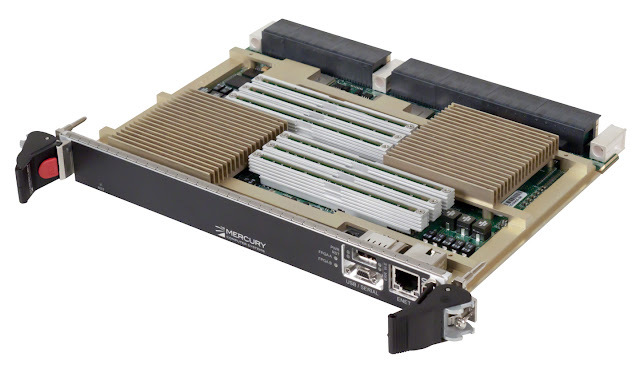 Freescale's MC56F82xx family takes aim at digital power conversion applications such as board-mounted digital power supplies for servers, industrial and telecom power supplies and advanced motor control. 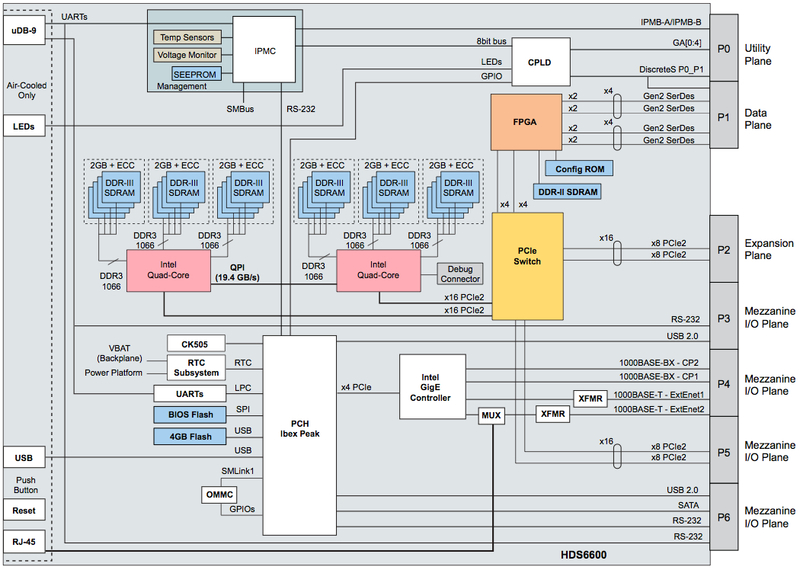 Here is what EETimes says about DSC: Freescale designed the DSC for advanced motor control as well as for power-conversion applications in on-board digital power supplies used in telecommunications, industry and servers. 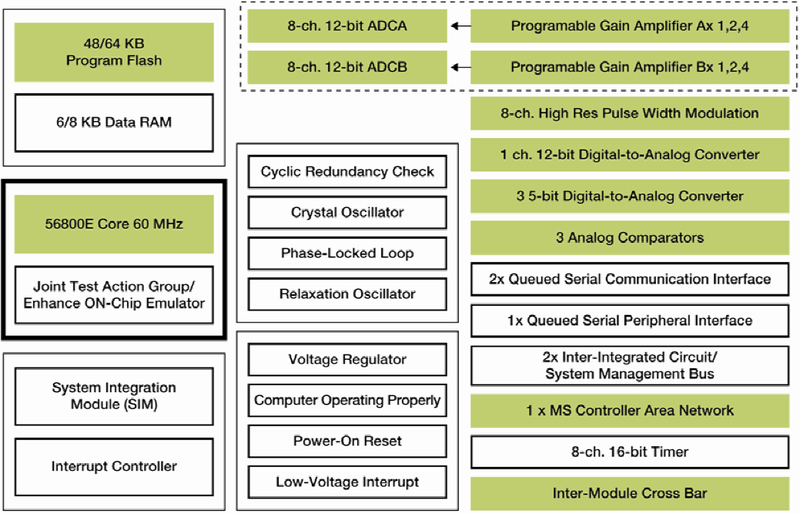 Its 56900E core provides programmability with DSP capabilities and on-chip peripherals include pulse-width modulators with nanoscale placement accuracy, fast analog-to-digital converters (ADCs) and embedded flash memory for algorithms. 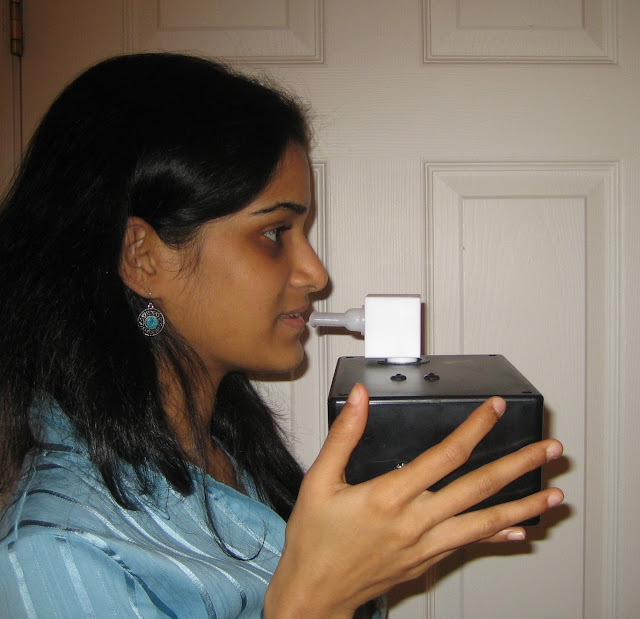 Recent Stony Brook University doctoral graduate Krithika Kalyanasundaram demonstrates the medical breathalyzer which she developed with professor Perena Gouma to detect disease. Here is what Smarter Technology says about breathalyzers: Using nanoscale sensors developed in the Center for Nanomaterials and Sensor Development, researchers at Stony Brook University in New York have designed medical breathalyzers that recognize signal gases in a single exhalation. Specific sensors could potentially be crafted for nearly any disease, according to the researchers. The National Science Foundation is currently funding pre-clinical trials for a diabetes breathalyzer. Perena Gouma is the brainchild at Stony Brook University who believes a medical breathalyzer can detect disease just by exhaling into it. 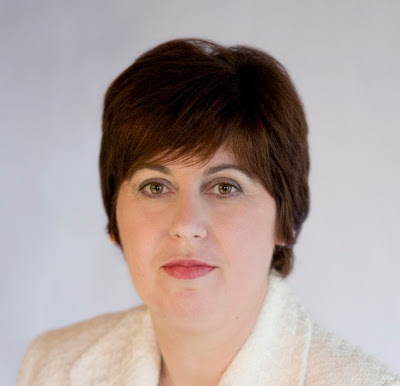 A single-breath exhalation has over 300 identifiable gases, according to lead researcher, Prof. Perena Gouma, director of Stony Brook's Center for Nanomaterials and Sensor Development. The key to identifying disease is developing a sensor for a gas that is only present in the breath for those infected—called a signal gas—such as acetone, which indicates a diabetic's blood sugar level. 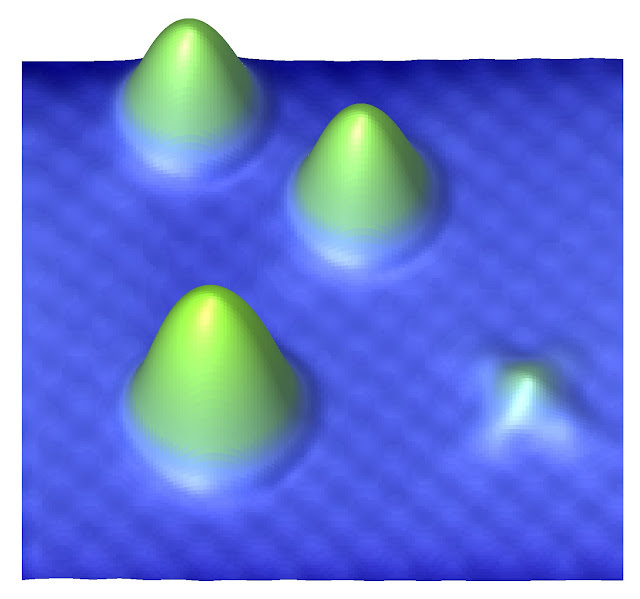 Here is what Smarter Technology says about PRAM: As flash memory becomes so dense that atomic-scale defects cause failure, many different approaches are being tried to replace the aging technology—from ferroelectric RAM (FRAM, which uses electrical polarization to enhance its DRAM-like bit cells) to magnetic RAM (MRAM, which stores information in magnetic bit cells). 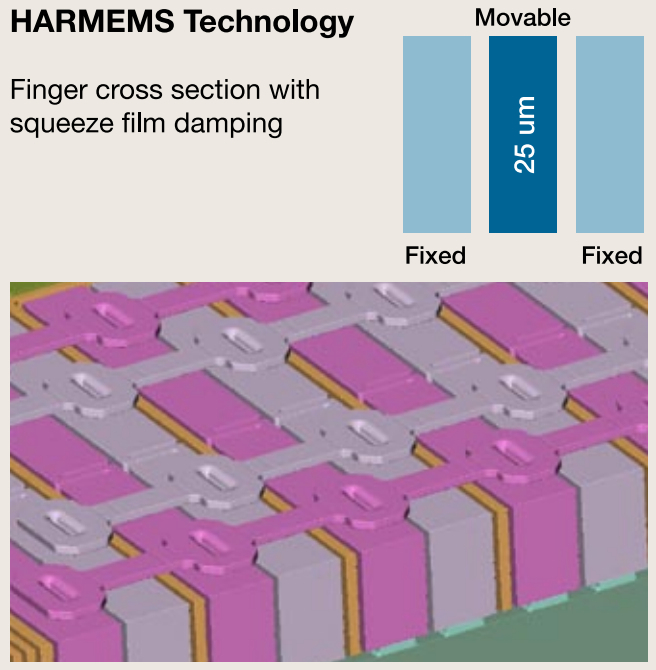 The most promising alternative for future terabit chips, however, is phase-change RAM (PRAM). PRAM stores bits as an amorphous or crystalline state of its polymer bit cell. 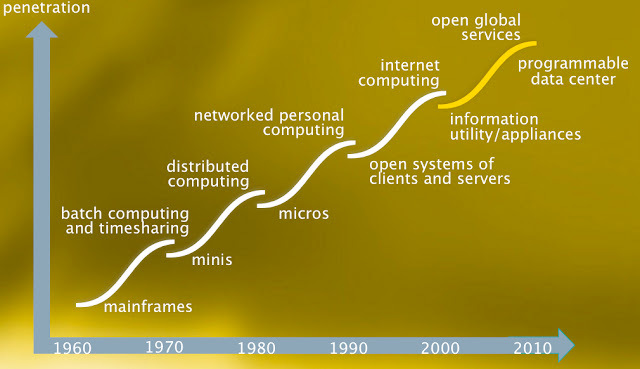 Now a new formulation invented by researchers from the University of California (UC) Berkeley and the Lawrence Berkeley National Laboratory (Berkeley Lab) aims to enable PRAM to take the baton from flash memories and win the race to succeed it. National Science Foundation's concept of renewing nano centers. 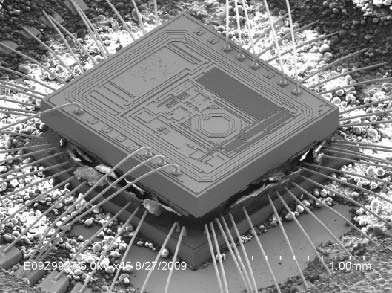 Here is what EETimes says about nano: Nanoscale electronics research will be funded through $2 million in grants from Semiconductor Research Corp. (SRC) and the National Science Foundation. 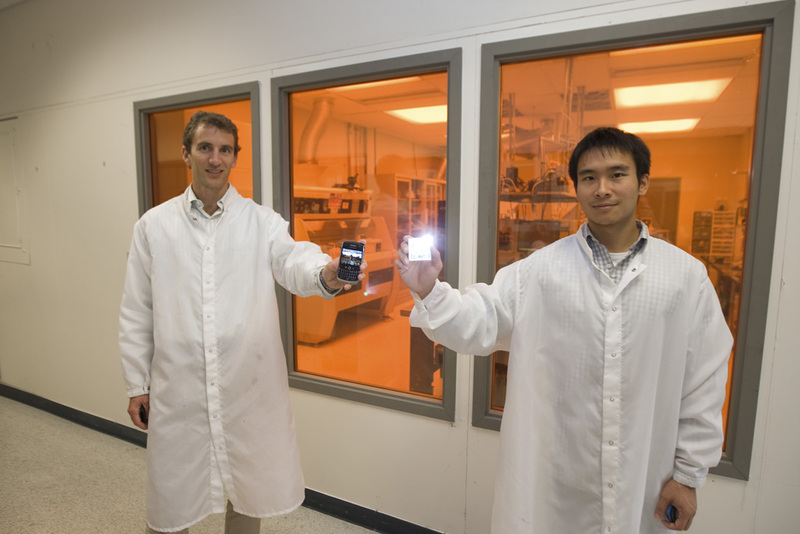 The grants were awarded to six existing NSF Centers at U.S. universities. Twenty-four earlier grants were awarded as part of the five-year old public-private partnership program, SRC (Research Triangle Park, N.C.) said. The overall aim of the Nanoelectronics Research Initiative is to spur collaboration among industry, academic and government researchers pursuing nanoscale switching technology to replace traditional silicon transistor within the next decade. The hope is that by building a foundation for transistor alternatives, like quantum mechanics, continued performance enhancements, power reduction and device shrinkage can continue uninterrupted. Electronic nose sniffs out chemical markers for disease with sensors crafted by electrospinning nanofiber and nanowire structures. Electronic nose sensors can not only detect disease but can also diagnose its progress, according to Stony Brook University researchers. 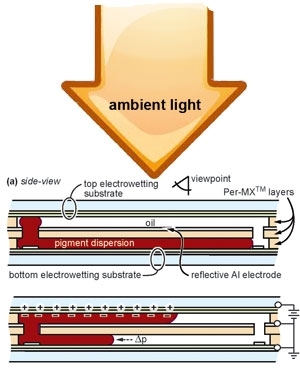 Nanowire-arrays of ultrasensitive sensors offer improved gas sensitivity, faster response and lower level detection than conventional approaches, promising to eliminate the need for blood tests in favor of breath-based diagnoses, the researchers say. Electromagnetic radiation runs the gamut from long-wavelength radio waves to short-wavelength light waves, but antennas are usually thought of as useful only for radio waves. Since an antenna's size is related to the wavelength it is intended to receive, radio antennas must be a millimeter or longer. 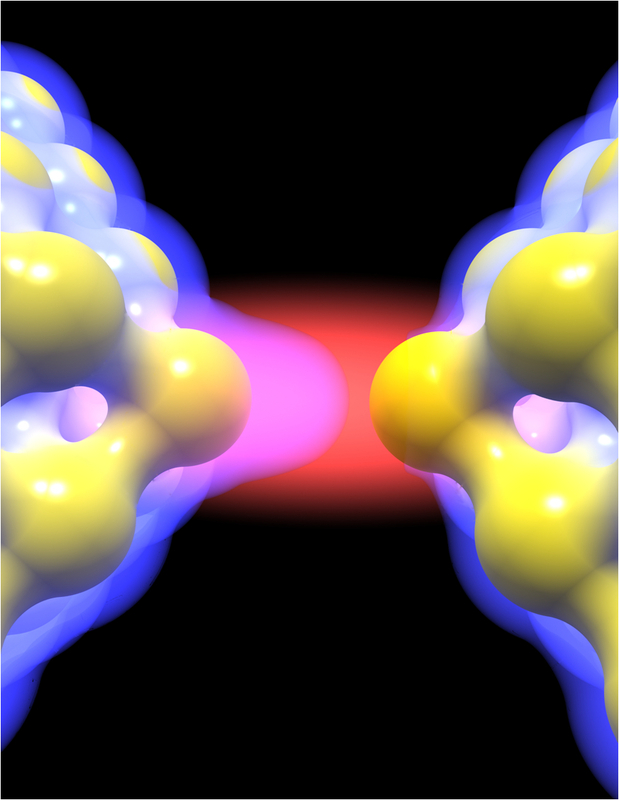 Since light's wavelength is measured in nanometers, antennas scaled down to that size should be able to receive the nanometer wavelengths of light. #ALGORITHMS "Swarm Intelligence Controls Robotic Planes"
Unmanned areal vehicles (UAVs) communicate with each other and the ground to fly in coordinated swarms for search and rescue operations. 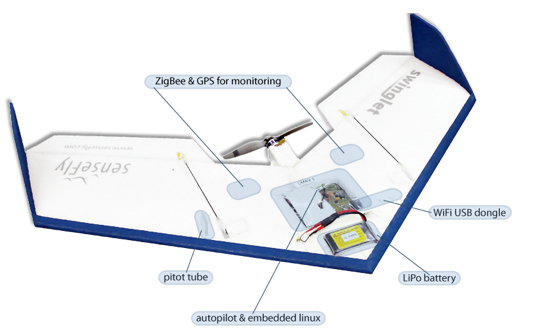 UAVS run Linux on a lithium-polymer battery powered single-board computer with an off-the-shelf WiFi receiver, a GPS module and a ZigBee transmitter. Here is what EETimes says about swarm intelligence: A new strategy for coordinated flight of unmanned aerial vehicles (UAVs) devised by the Swiss Federal Institute of Technology uses coordinated communications to allow a single operator to control an entire swarm of ultra-cheap robotic planes, rather than depending on expensive radar or lasers to locate and coordinate the flight of swarms or UAVs. 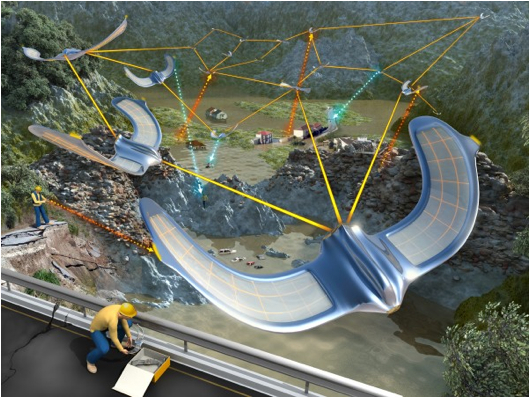 Created in the Laboratory of Intelligent Systems at the Ecole Polytechnique Federale de Lausanne (EPFL), the Swarming Micro Air Vehicle Network (SmavNet) project uses small (32-inch wingspan), lightweight (under 1 pound) UAVs with an electric motor and two control surfaces (ailerons and elevators) running on a single lithium-polymer battery with a flight-time of 30 minutes. The UAVs use GPS for location and WiFi for communications plus only three inexpensive sensors—a single MEMS gyroscope and two pressure sensors. 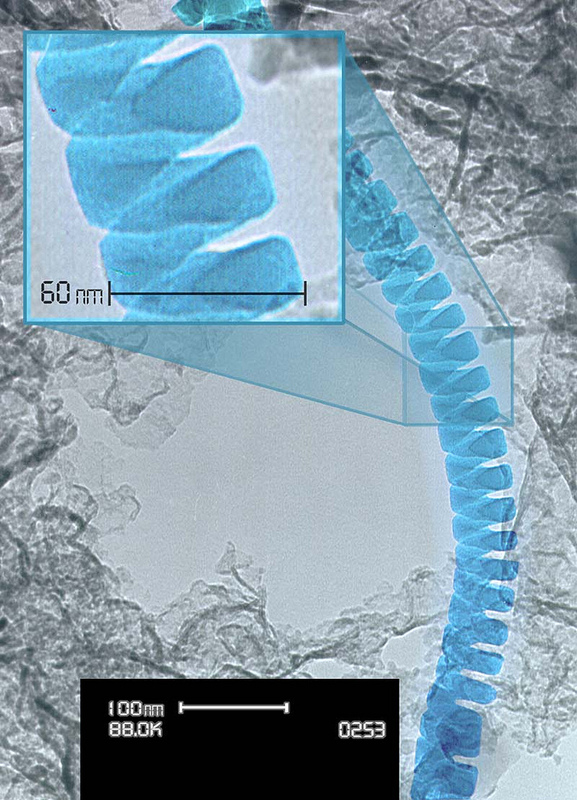 Silicon dioxide nanosprings resemble old-style curled-up phone cords, but can carry biomolecules that enable handheld mobile battery-powered medical diagnostic devices that give instant results on a variety of medical conditions. Here is what Smarter Technology says about nanosprings: Nanosprings aim to enable handheld medical devices that give instant diagnostics, yet are cheap enough to be deployed everywhere—from the rural outback to your doctor's waiting room. Oregon State University researchers recently demonstrated nanosprings holding biomolecules that could be used in bio-sensors for the production of pharmaceuticals and for the micro reactions used in mobile handheld medical "labs on-a-chip." 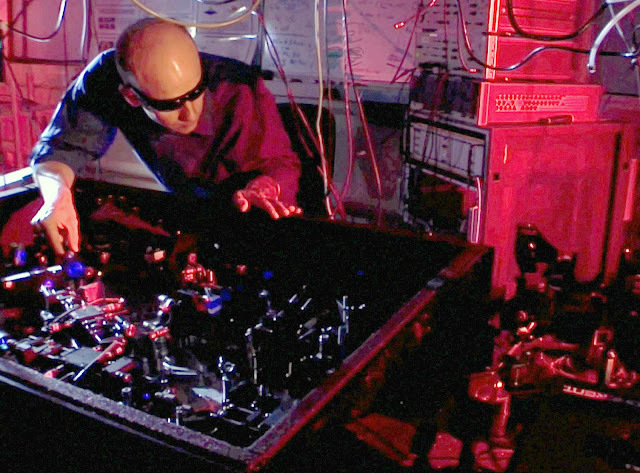 #OPTICS "NIST Crafts 'Schrodinger's Cat' from Light"
NIST research associate Thomas Gerrits at the laser table used to create "quantum cats" made of light. These colorized plots of electric field values indicate how closely the NIST "quantum cats" (left) compare with theoretical predictions for a cat state (right). The purple spots and alternating blue contrast regions in the center of the images indicate the light is in the appropriate quantum state. Austrian physicist Erwin Schrodinger constructed his "cat" experiment as a "reductio ad absurdum" argument against one interpretation of quantum mechanics. Einstein had recently described quantum entanglement in an article suggesting that superposition of opposite states in atomic quanta could also become macroscopic. To illustrate the absurdity of that notion, Schrodinger constructed the situation where a cat could be both alive and dead simultaneously. I Won "Kyoto Prize Journalism Fellowship"! 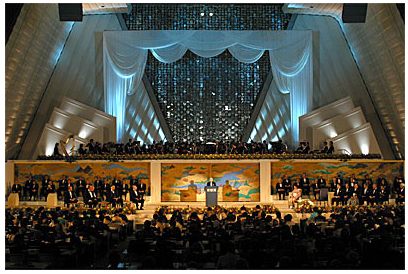 The Kyoto Prize is one of the world’s most prestigious awards given to those who have made outstanding lifetime achievements in technology, science, or the arts.